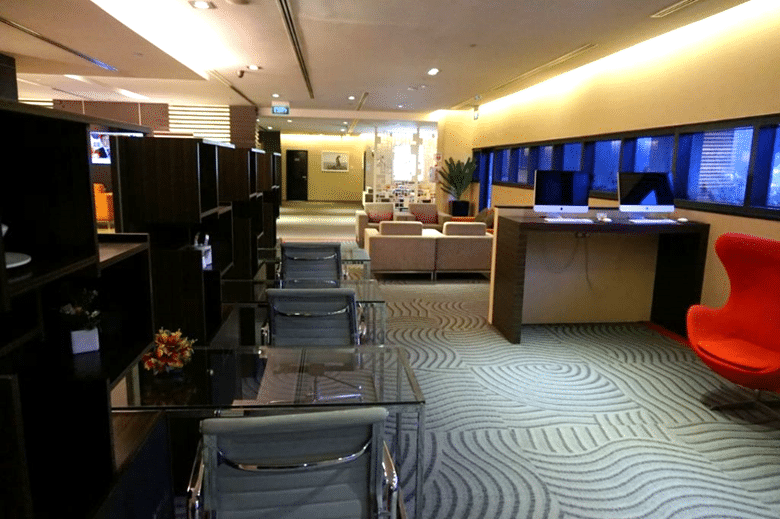 The JetQuay CIP Terminal at Changi projects an aura of luxury and exclusivity, but unfortunately that's all it is- an aura. 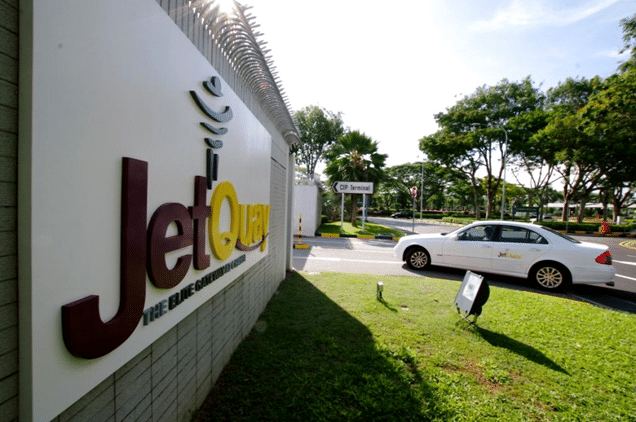 The JetQuay CIP Terminal isn’t exactly that new a feature at Changi Airport. The facility is actually more than 10 years old, having opened way back in September 2006. At the time, the media team put out a constant stream of press releases waxing lyrical about a “sensory experience in transit“, “a new breed of airport terminal“, and even invoked the name of the Wright Brothers in declaring (somewhat hyperbolically) that this too was the dawn of something grand. As you sip your drink, you check your email on a computer monitor built into your lounge table. Later, after inspecting the limited edition Samsonite Black range of Alexander McQueen designed luggage, you choose a piece from the Tiffany’s display and then move on to browse the art gallery filled with the work from some of the finest contemporary Chinese artists. While you contemplate that you really “should” work out at the gym, a personal shopper goes to the duty free to collect your preferred items on your behalf. 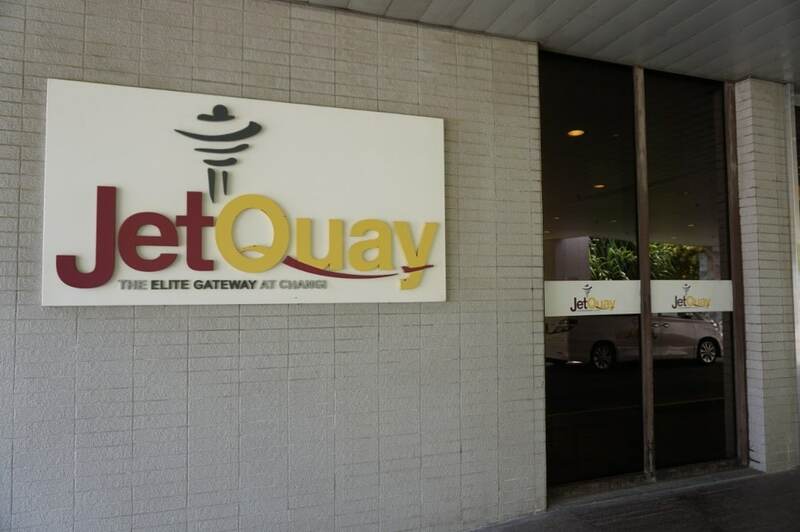 The sad thing is: fancy marketing aside, the JetQuay terminal wasn’t actually all that great. I’ll always remember reading this trip report from 2009 on SQTalk where the author reported that the sum total of the hot food options was…instant noodles. Yes. The sensory experience in transit must evidently include a liberal serving of MSG. But I’m always game for trying a new experience, especially when I don’t need to pay for it. 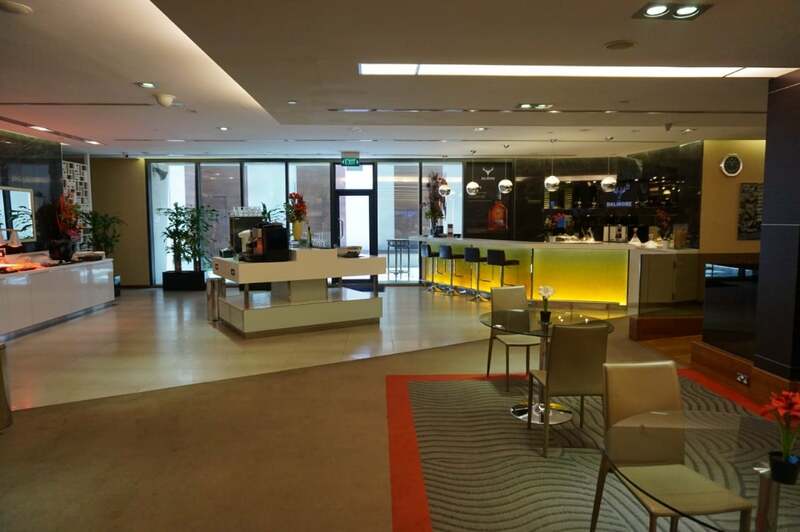 Thanks to my Citi Prestige card, I’d managed to secure complimentary access to JetQuay for myself and The Milelioness prior to our positioning flight to Hanoi. This Quayside service has a list price of $400. 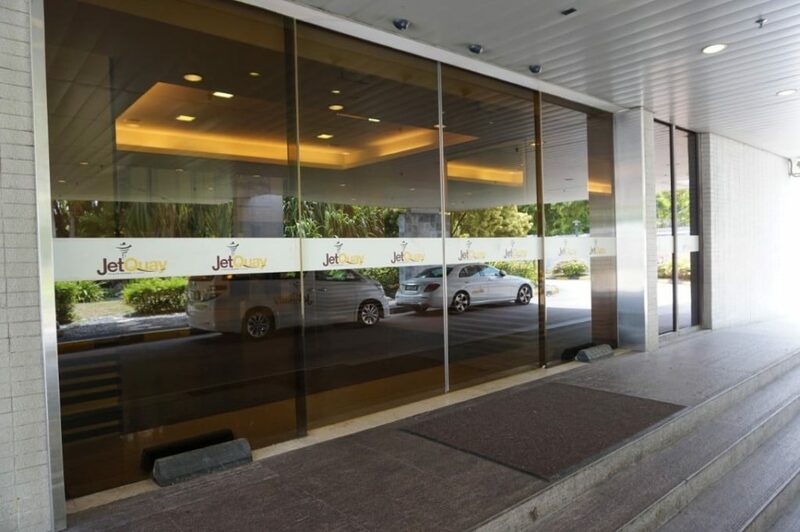 Complimentary JetQuay access is available to anyone who holds a World or World Elite Mastercard credit or debit card issued in Singapore. 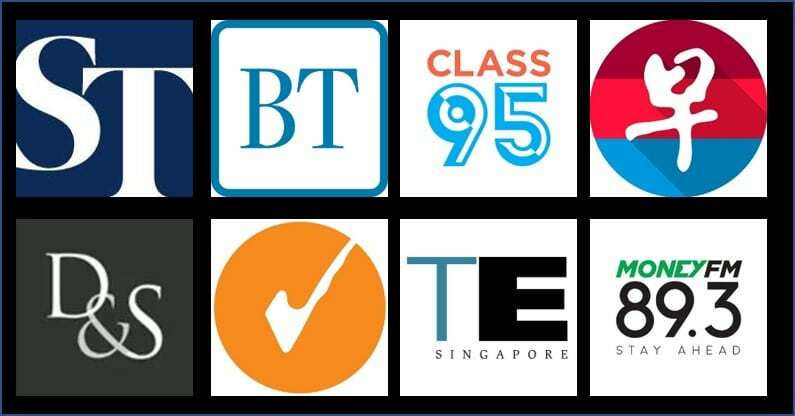 This is limited to 100 redemptions per month on a first-come-first served basis, and for travel completed by 31 October 2019. Access is provided for the cardholder plus one companion. You can get more details here. 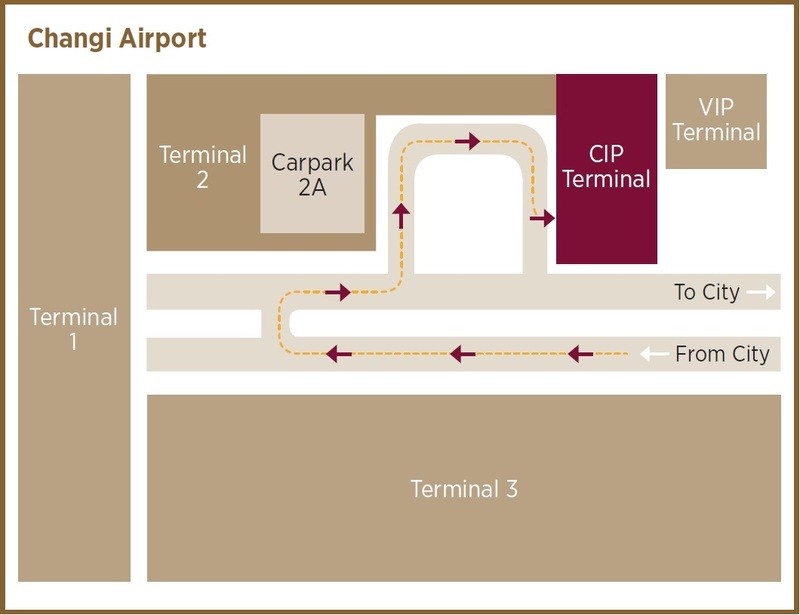 The JetQuay CIP Terminal is located near Terminal 2, just past the public drop-off area. There are several signs for it, so it’s hard to miss. Look out for the high security walls and big sign proudly proclaiming “the elite gateway at Changi”. You’ll go past a security checkpoint where the guard will verify your name and flight. After that, it’s a short drive to a sheltered dropoff point where two JetQuay staff are waiting to meet you and assist with your bags. 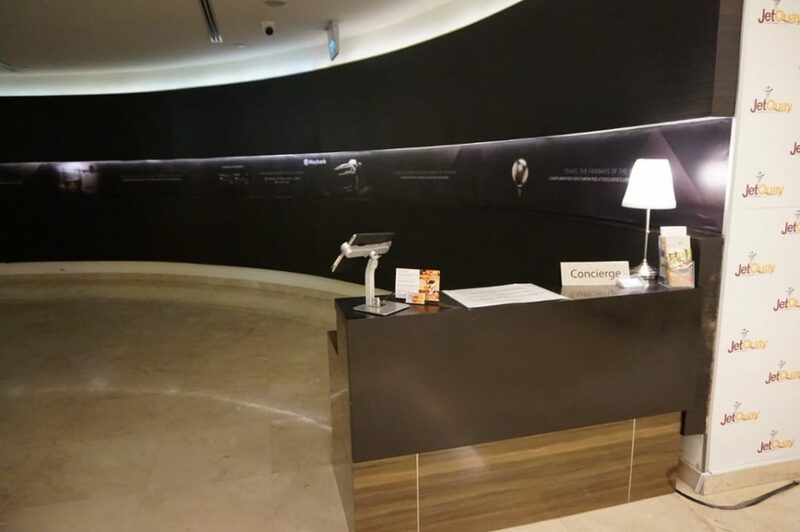 Once you enter the facility, one member of the staff will head left with your check-in bags and passports. 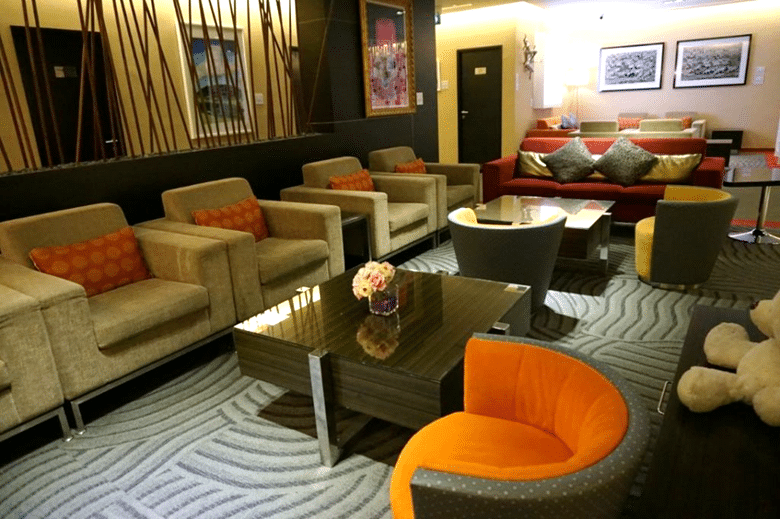 The other will take you right to the lounge area. Since we were on a sort-of complicated itinerary (SIN-HAN on MI, then HAN-HKG-SFO on KA/CX), I wanted to make sure our bags got tagged properly- and indeed they were able to interline the bags without any issues. 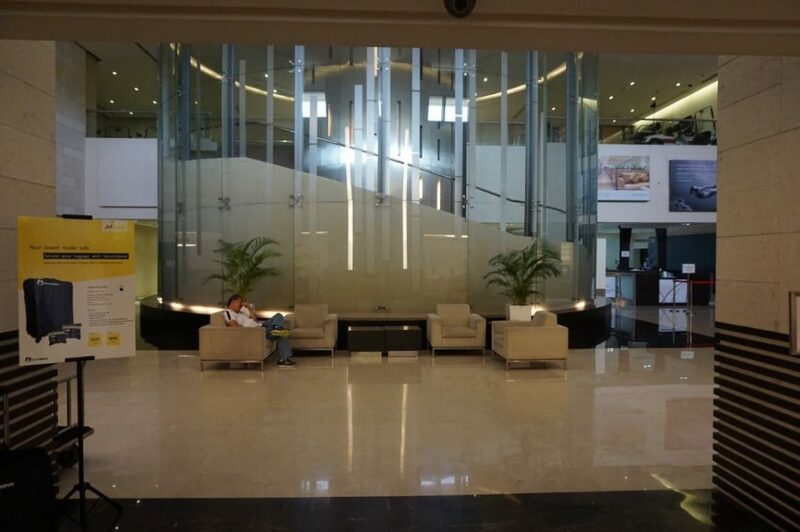 I’m going to be honest- the first impressions of the JetQuay lobby weren’t exactly great. 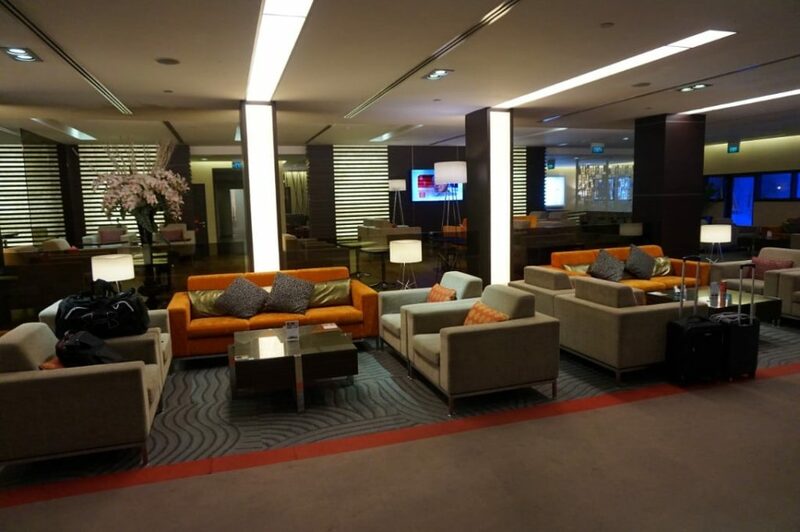 It’s certainly not visually stunning the way some modern hotel/lounges are. In fact, I felt it was kind of sterile and dated. 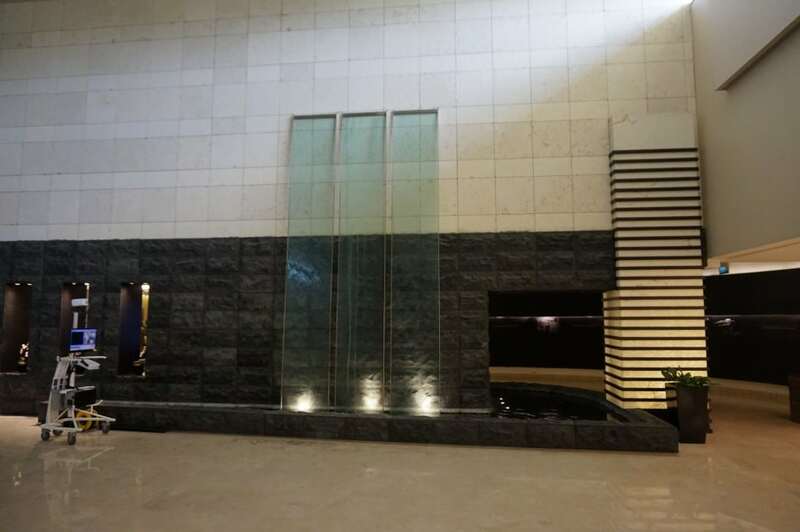 The lounge chairs looked worn and tired, there was some bland mass-produced art on the walls, and the tiles reminded me of a past its prime Sheraton. In fact, that’s exactly what the JetQuay terminal reminded me of- a Sheraton. 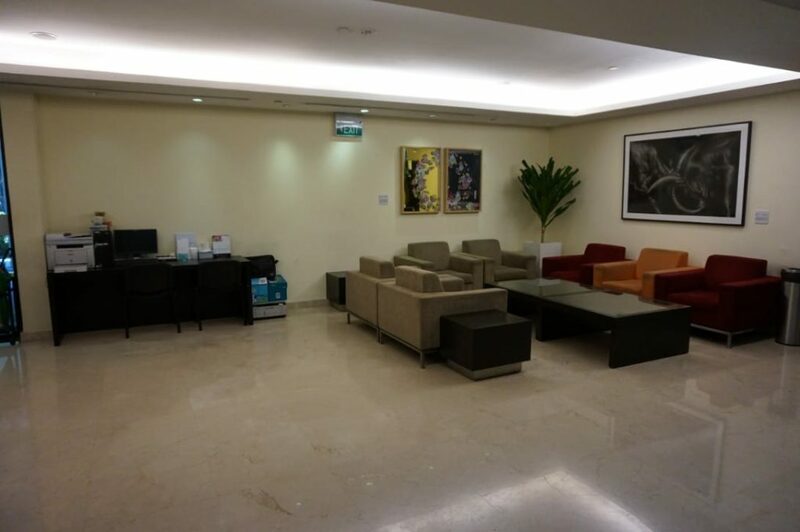 The JetQuay lounge proper is past the concierge desk on the right of the lobby. 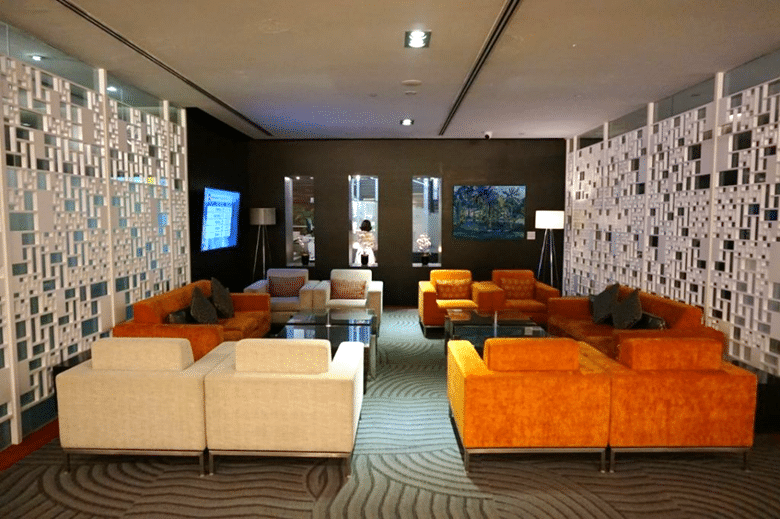 It’s a large-ish lounge for the number of clients you’d expect to use a facility like this. There was certainly no shortage of seating when we arrived on a Saturday at around noon and the noise level in the lounge never rose above an audible whisper. Again, I don’t think the choice of decor is going to win any interior design awards. In fact, it looks more “cheap and cheerful” than “oozing luxury from every orifice”. The color scheme reminded me of what I’d seen at ibis hotels, or closer to home, the budget-friendly Harris chain in Indonesia. There’s also a severe lack of natural light in the lounge, so I hope you like florescent lighting. 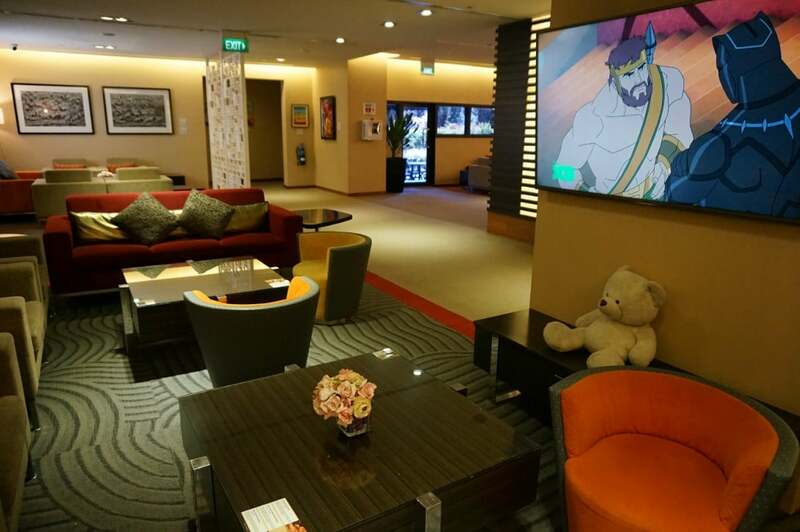 Apart from a small kids’ corner with a communal teddy bear (that’d I’d be very weary about letting a child hold) and some cartoons on the TV, I didn’t see any other child-friendly facilities. 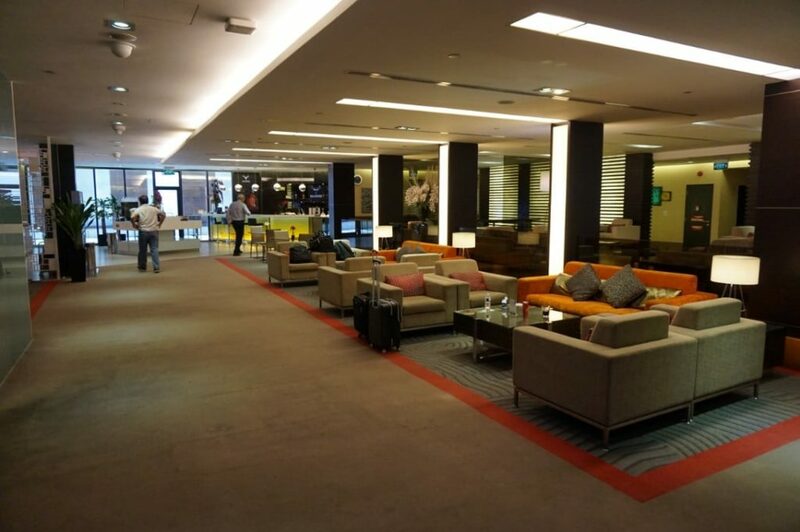 I found the layout of the lounge to be a bit weird. 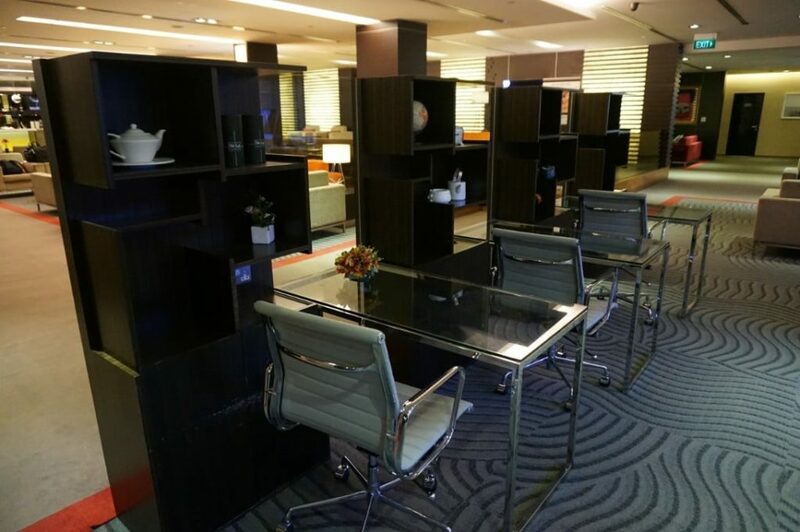 For example, the entire dining area was two small tables- if these were occupied you’d have to hunch over your food at one of the side tables elsewhere. It’s strange to have so much real estate dedicated to sitting, and then two small 2-seater tables for dining almost as an afterthought. There’s a small business centre with a couple of Mac computers and desks. But there were no chairs at the table with the computers, meaning they’re for brief usage only. Similarly, you’d think the desks with chairs might be a better place to put the computers, but instead they were empty. 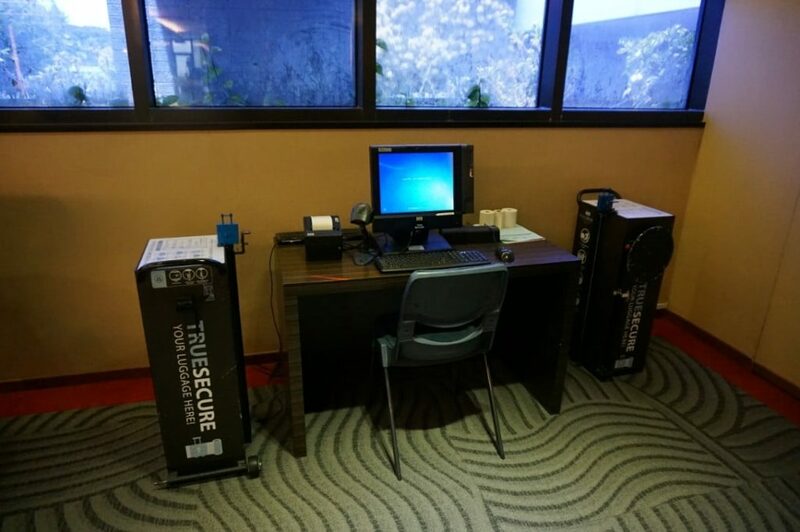 An interesting feature was a TrueSecure luggage wrapping station, the kind where they wrap your bag in clear adhesive film in the somewhat mistaken belief that this makes your bag safer. 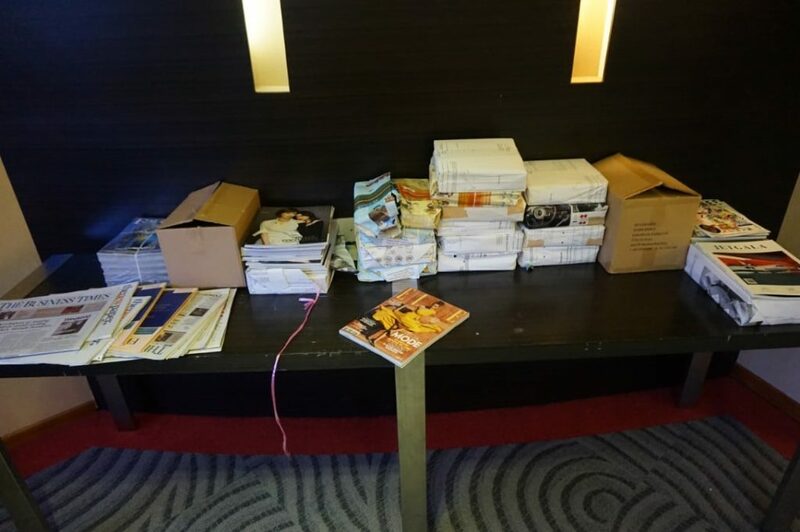 At the corner of the business centre was a rather unsightly mess of newspapers and magazines still wrapped in their distribution packets. It didn’t bother me, although I can’t imagine why in a place like this you wouldn’t pay attention to small details like housekeeping. The main attraction of the lounge (since there’s precious little else to do) is the buffet area. Here’s where you’ll find the bar, with space for four people to sit. Given that there was no bartender, or option to order cocktails, I did wonder what the point was. 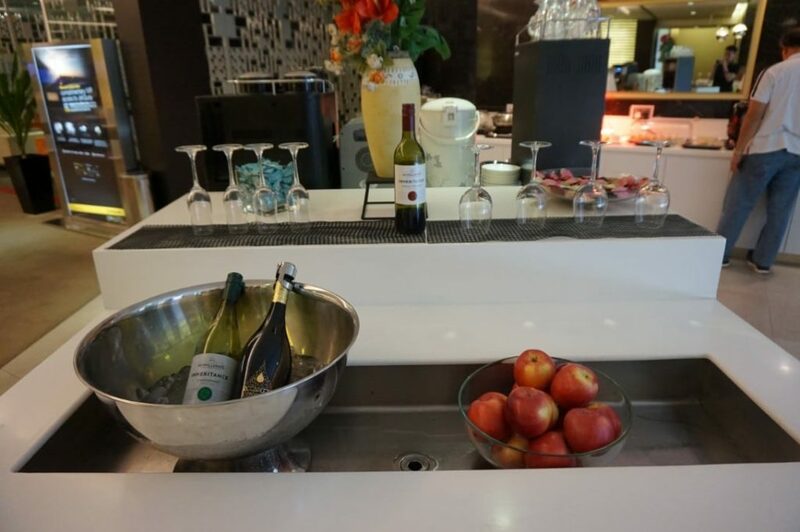 Although there’s complimentary wine available in the lounge, not all the alcohol is free. 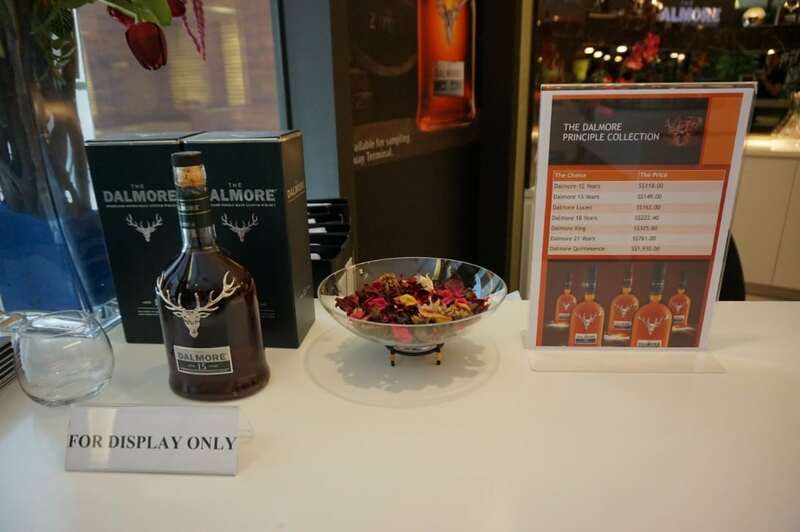 Dalmore single malt whisky was available for purchase. 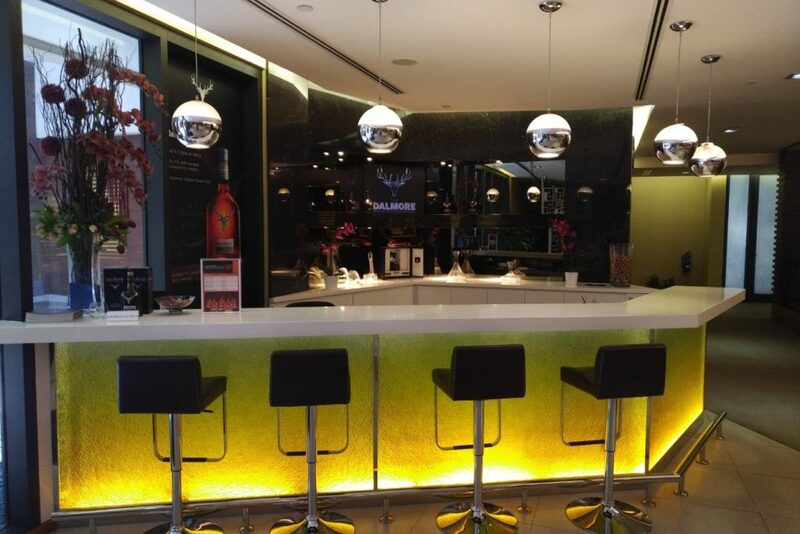 Given the clientele of the lounge, it seemed like a strange decision- sure, some might be rich enough to buy it, but I would have thought that high-end brands would want to take this opportunity to offer free samples in the hope of securing further patronage. 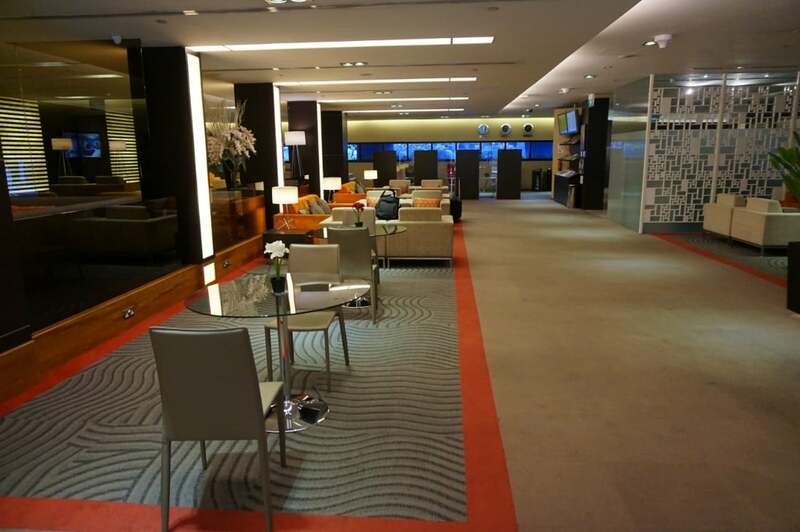 That seems to be the approach that Plaza Premium is taking in Hong Kong with the Plaza Premium First lounge, where Elemis, Lavazaa and TWG offerings are available. 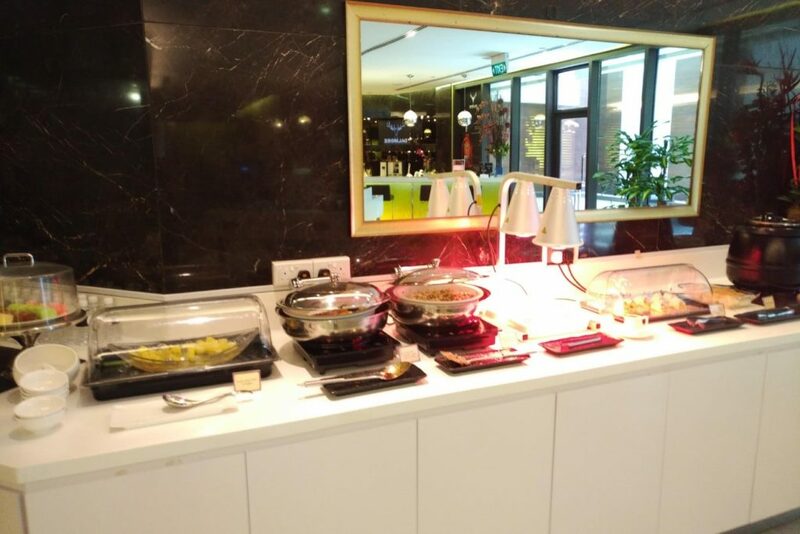 The buffet offered two hot items, two fried options under heat lamps, some cold sandwiches and wraps, a few pastries and cakes, and small tidbits. 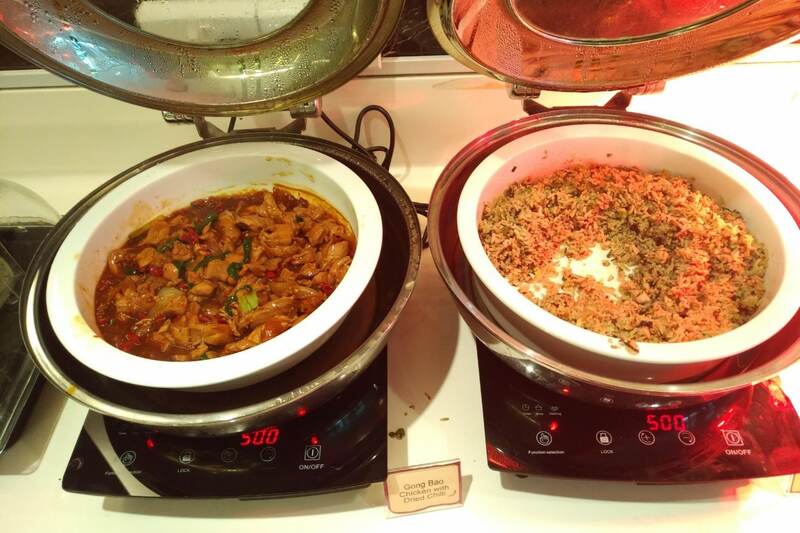 The hot items today were olive fried rice and gong bao chicken. I was surprised at the lack of a separate vegetable dish, although I believe the olive fried rice was labelled vegetarian. I gave the cakes a miss, although they looked like nothing to write home about. 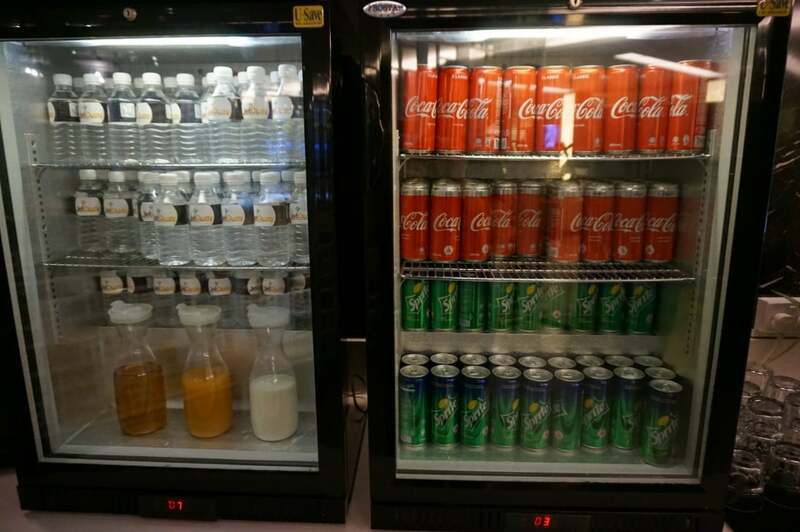 For drinks: bottled water, Coke and Sprite and some (non-fresh) juices. 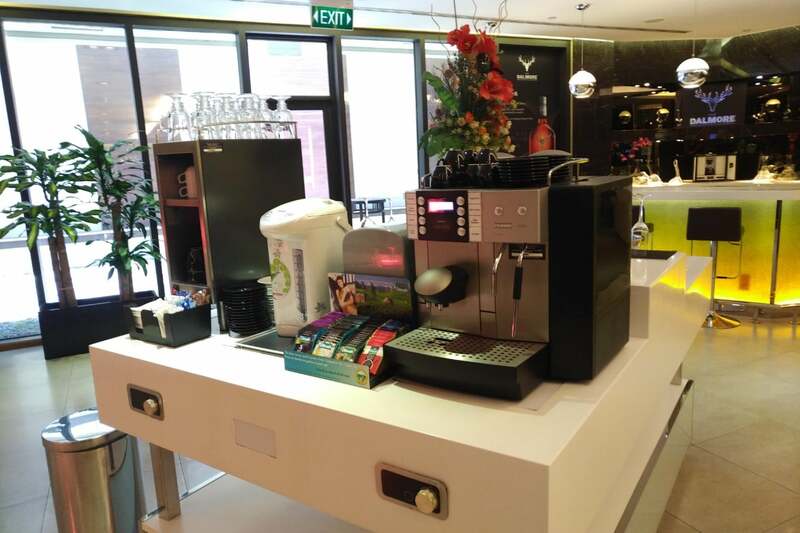 A small selection of teas and a proper coffee machine were also available. 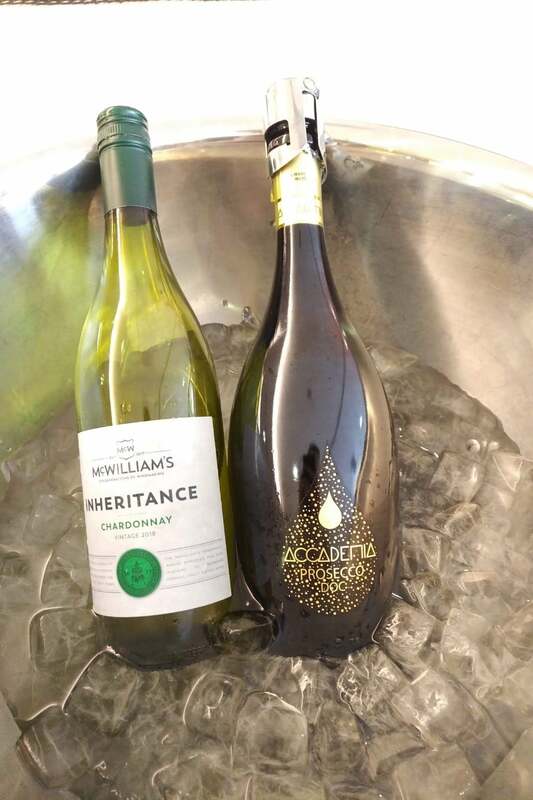 The alcohol selection consisted of a single red, a single white, and a bottle of prosecco. 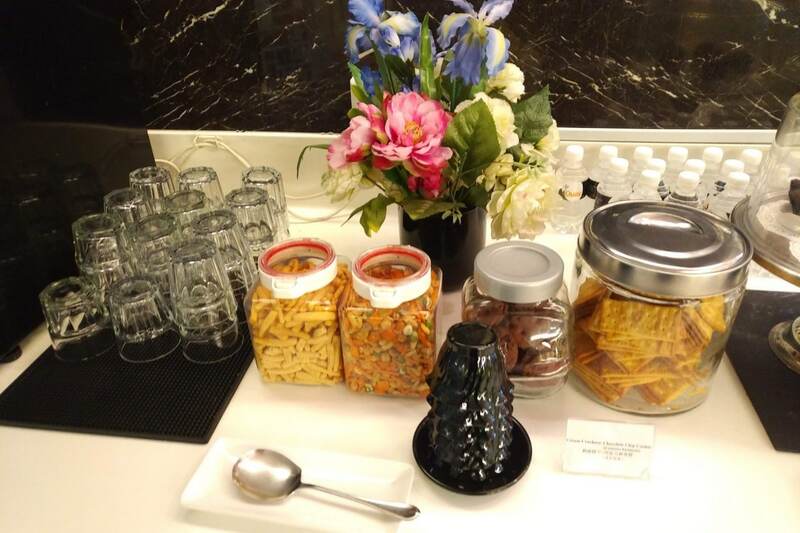 At some point in the past, the lounge served Moet and Chandon champagne, but this is all you get now. What did I think of the F&B? In a word: mediocre. I get that this is an improvement over the instant noodles only fare that previous visitors endured, but let’s put things in perspective: this is a CIP terminal that markets itself as catering to the 1%. 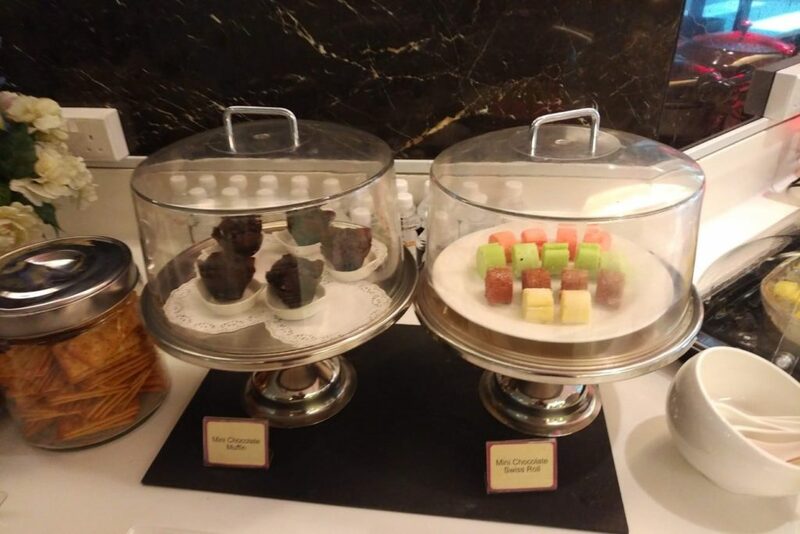 I’m not even asking for a made-to-order menu (although that would be much more in line with the branding), but would it be unreasonable to expect a higher quality buffet? 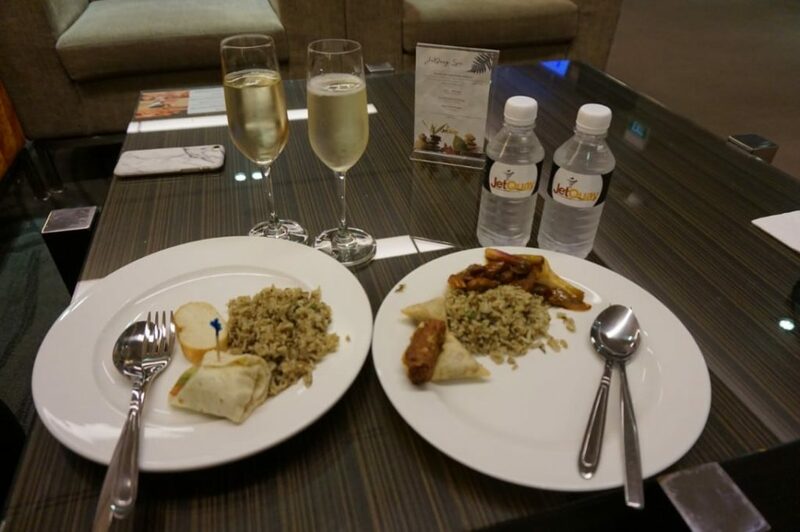 The dining experience certainly did not befit a facility like this, and as much as I give the SilverKris lounge in Terminal 2 a hard time, we’d have been much better off eating there instead. As it was, I left the lounge hungrier than when I came in. After we ate I paid a quick visit to the toilets. The toilets are surprisingly not gender segregated. 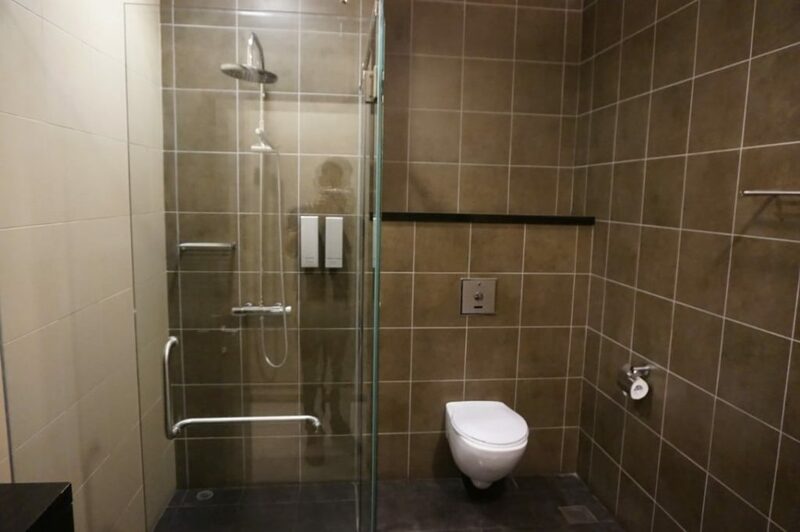 Instead, what you have is a common hand washing area, and then individual shower rooms with toilets inside. 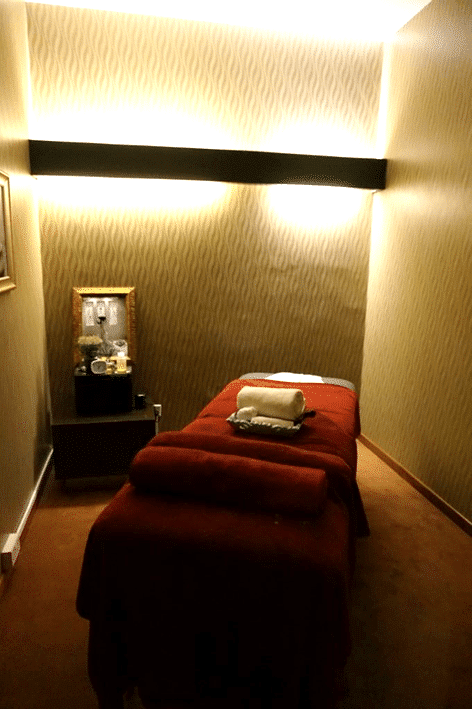 In my exploration, I also came across a few rooms that are used for massage treatments. 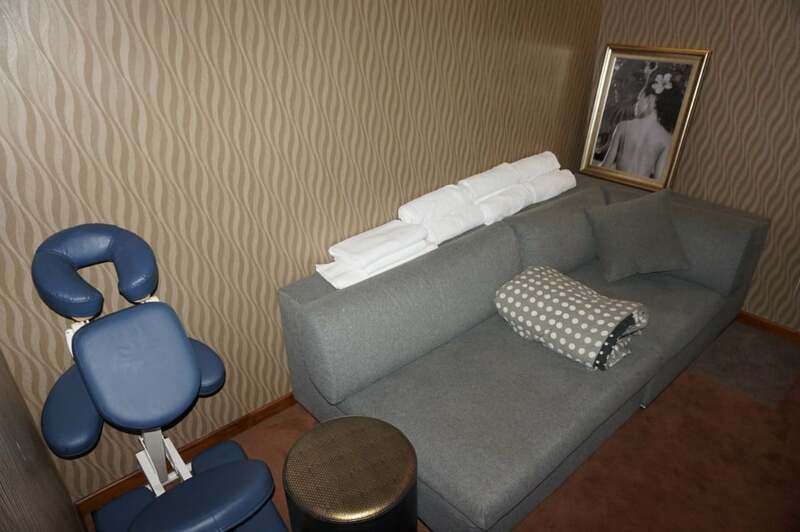 Massage treatments are available in the lounge, but again they’re not complimentary. These also looked like they could double as day rooms for anyone wanting to catch up on sleep. When it’s time to board your flight, a representative will come and find you. 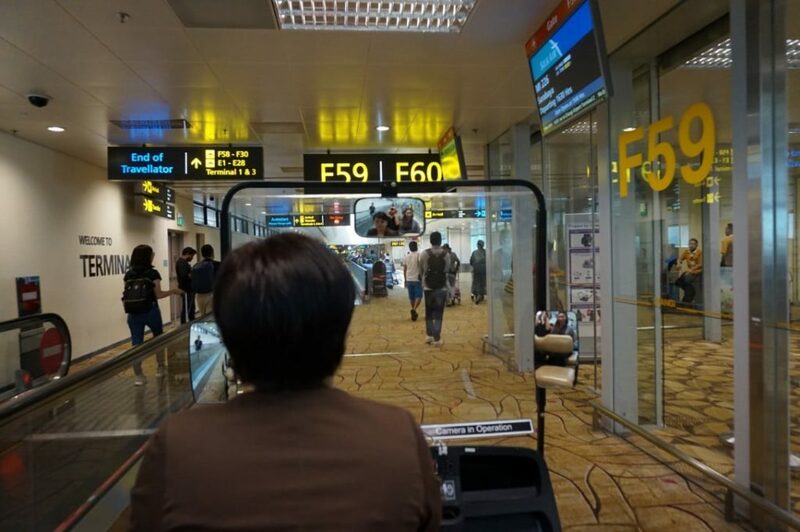 This is probably the most fun part of the whole experience, because you get escorted to the second floor of the JetQuay terminal and board a buggy that takes you to your gate. Our ride was very short given that we were departing from a gate in Terminal 2 close to the terminal, but it was a novel experience nonetheless. 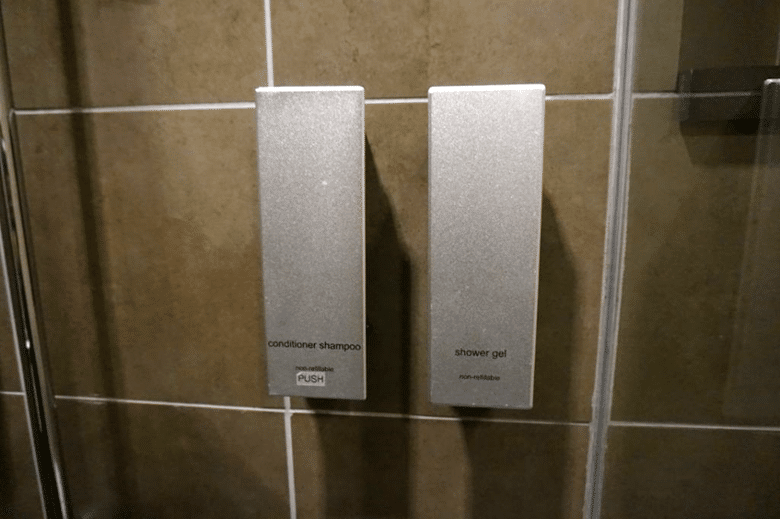 If it sounds like I was unimpressed by the JetQuay CIP terminal, it’s because I was. I would certainly have been very disappointed if I paid $400 for the experience, and I don’t think it offered anywhere near the level of luxury that it purports to. It’s certainly private, and maybe if you’re a high profile celebrity or someone who has a fear of crowds then you’d appreciate the secluded, white-glove experience. But otherwise, the dark and uninspiring decor, the poor quality F&B options and the lack of any true wow factor make me wonder what all the fuss was about. 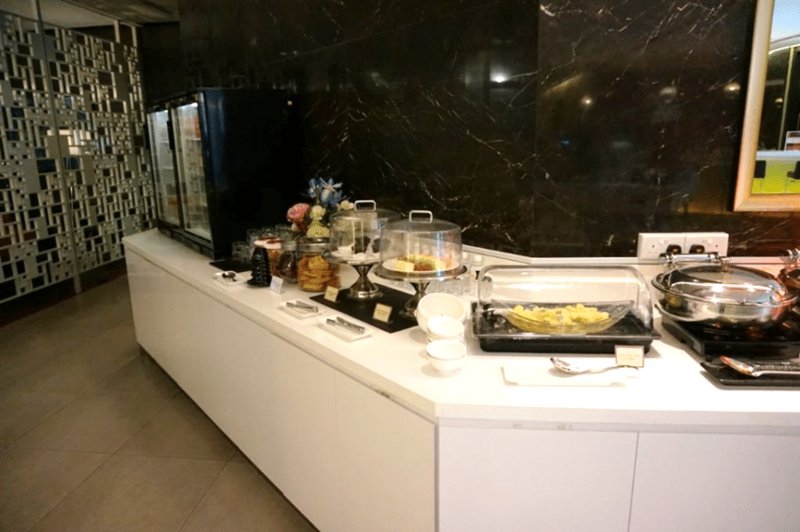 The silver lining was that the service in the lounge was uniformly excellent. The staff were polite to a fault and very friendly, and I even managed to have a lovely chat with one of the managers who was a very interesting former SQ cabin crew. 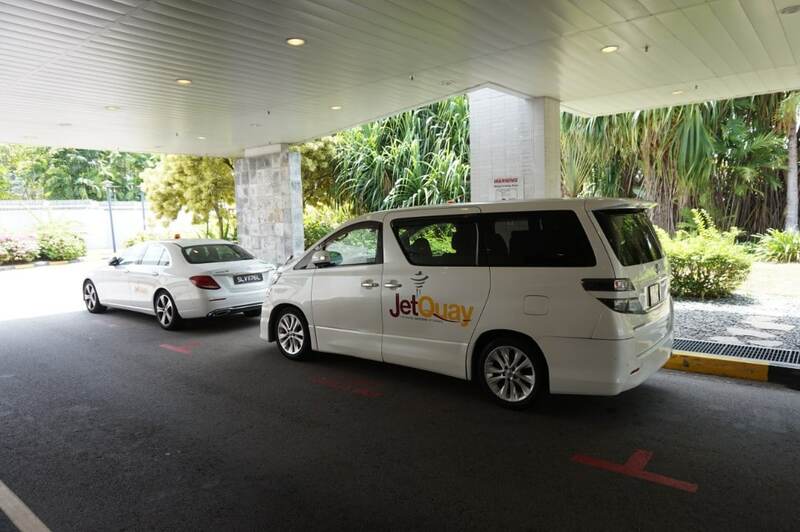 Should you visit the JetQuay CIP terminal? Yes, if you can do so for free, and if only to check it off your list. 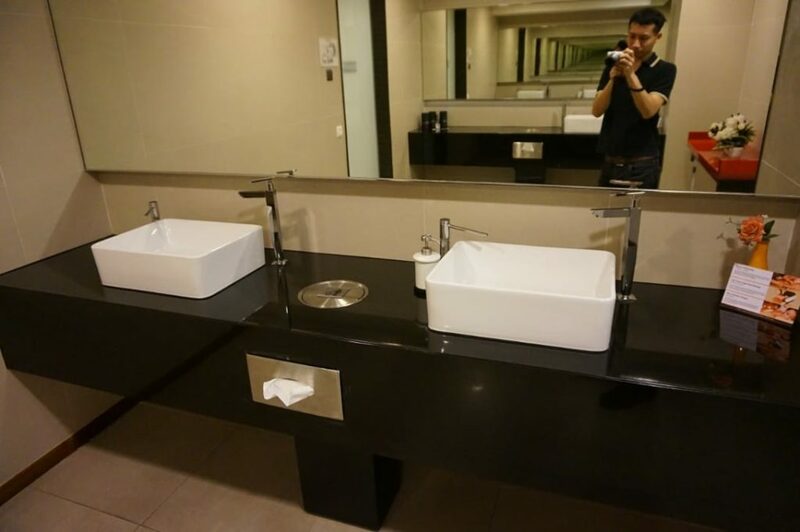 Subsequently, however, you’d almost certainly be better off with the far superior offerings of Changi Airport. Thanks for the insight. 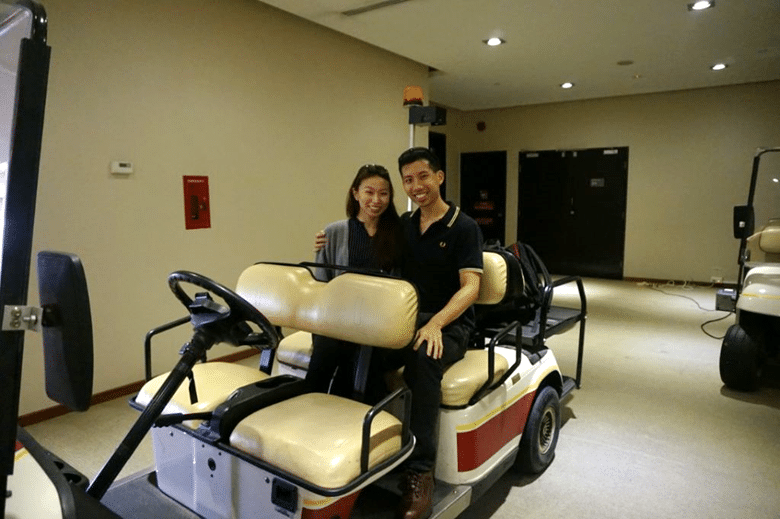 It is true that there is nothing special at all except for the buggy ride. Sadly I think it has passed its prime where no one will want to pay unless you want almost total privacy. There are way more options and offerings nowadays. 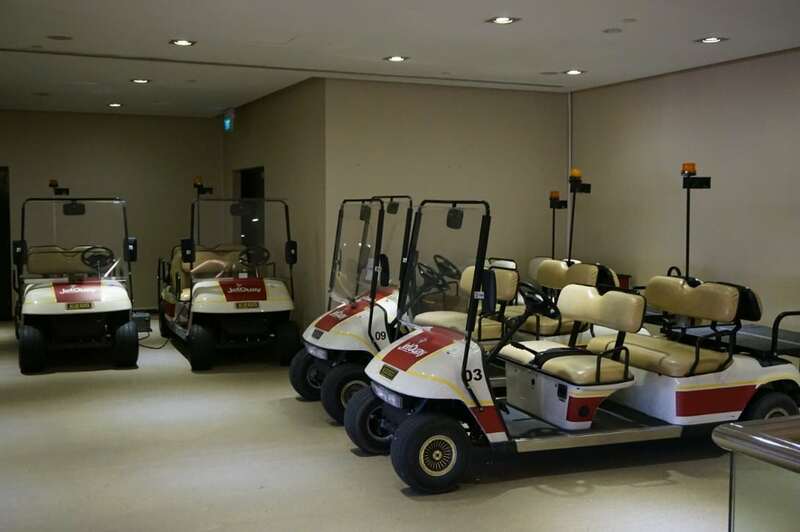 We ONLY use it when flying Y or LCC, to skip queues.. can’t be a**ed abt the buggy cos legs still work fine.. haha.. Thanks Aaron for the post. Did drive past this many times and wonder what’s inside, and it truly look like some dated Chalet! I always use it for arrival when taking Y.
Bcs no need to queue up wait for luggage. I gotta book a Europe flight end of next week. Any insights/experience whether 5th of a month would still give me a chance to redeem that one? Also, does it matter (to Mastercard) whether i book with the airline directly or via an OTA? Applied for JetQuay service on Mar 15 via Citi Prestige Concierge and got it confirmed the next day for my flight this weekend. I didn’t book using the Mastercard as well. Looks like this person also was unimpressed by it., and this was posted 2 years ago!